← Welcome to Rm. 202 (2013)! You know, guilt accountability is a crazy thing. Now that I’ve made the commitment to actually write about my IMWAYR, I feel pressure to do more reading and want to have new, exciting things to share each week. That being said, I have to admit: I haven’t read a thing since last Monday. Not. A. Thing. Ok, so both Hidden and Will at the Battle of Gettysburg 1863 are both Mark Twain Nominees that I still want to read so I can share with my new readers. 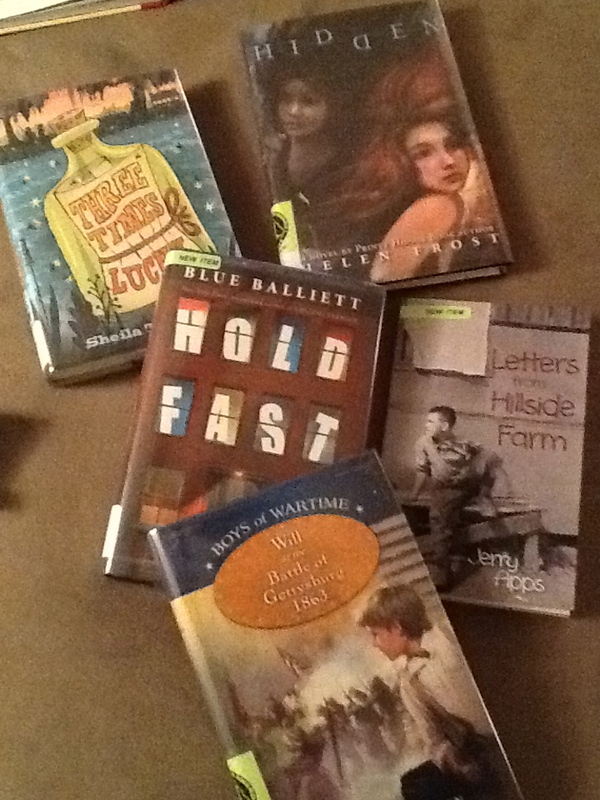 Hold Fast and Three Times Lucky are both titles I’ve read about from my friends on Twitter, and Letters From Hillside Farm looked like another great historical fiction title that could possibly be incorporated into Social Studies or used in small groups or read aloud. So what I’m really excited about from my library trip this week are the titles I picked up that are NOT middle grade novels that I might use at school. After reading The Book Whisperer by Donalyn Miller recently, I was challenged to do more reading that was just for me, or just because. Maybe even an adult fiction title or two. It feels a little weird, because it’s a kind of reading that is new to me, but I know it’s important as I build my identity as a reader–which will spill over into my connections with and recommendations for readers in my room. These are suggestions from other readers I respect: my friend, Lisa, who reads EVERYTHING and my high school English teacher, Carol Jessen (who I reconnected with on Facebook last week!). Ms. Jessen suggested the two titles by Ruth Reichl because of the food themes (which I mentioned in my writing about the Mark Twain nominees I’ve read), and they seemed really great. I hope to be able to share them with Grant (my husband) when I’m done, because he’s definitely both a foodie and a reader and would love that combination. Bringing up Bebe was on Lisa’s GoodReads list, and is all about how French mothers raise their children. This is intriguing to me, and I know Lisa loved it (because I’ve heard her talk about it before! ), so I figure I will, too. 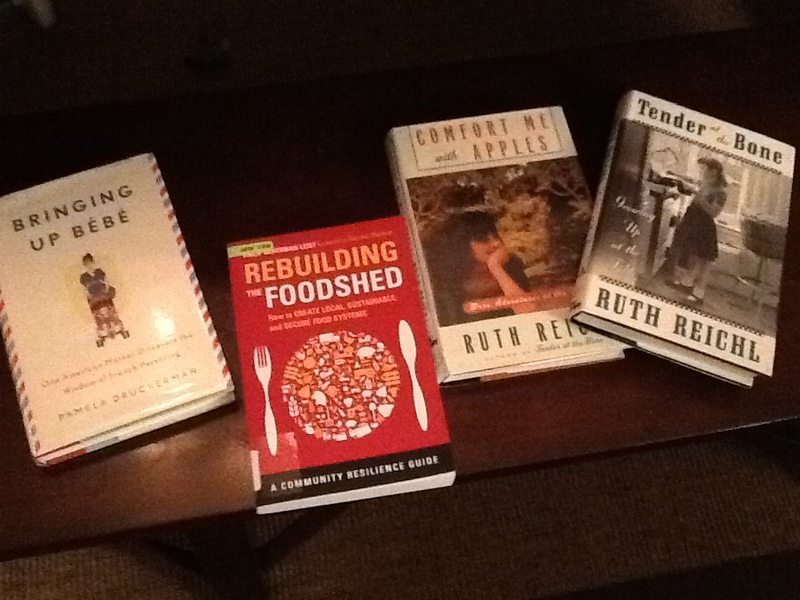 The last one is about another recent interest of mine–local, organic, healthy eating. Now, all I need is time just to sit this week. Maybe I can squeeze out a few last days of summer break to get it all done?? Have you read any of these books? What did you think? Have you read The Book Whisperer? How has it changed you as a reader or a teacher? I’d love to hear from you. Please leave your comments! Posted on July 29, 2013 by Jen Bearden	• This entry was posted in Reading, Summer Vacation and tagged IMWAYR, reading, The Book Whisperer. Bookmark the permalink. I also have plans to be successful and to make friends.